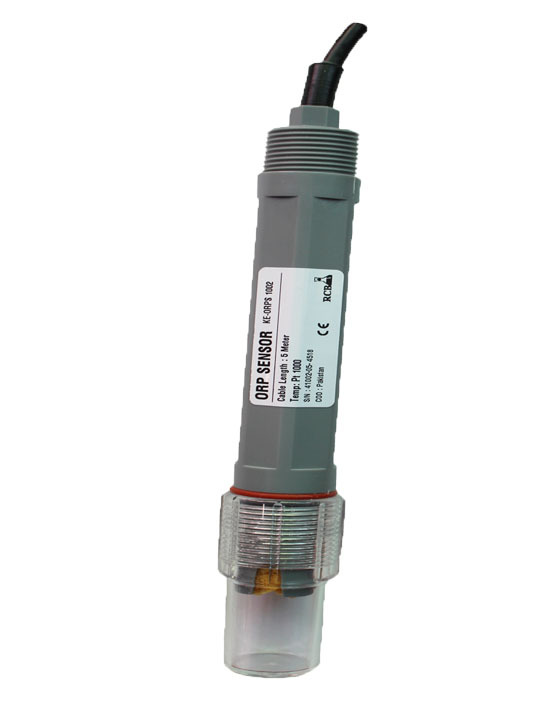 The industrial standard KE- pHS 1001 sensor is a solid dielectric sensor used for continuous monitoring of surface water, ground water and industrial effluent water. The durable PTFE body has an excellent chemical compatibility with anticlogging design which provides easy maintenance. 1. 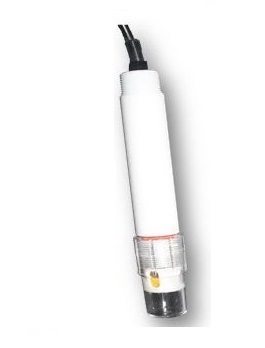 Long Distance reference diffusion path extends electrode life even in harsh environments. 2. High accuracy with fast response and good repeatability. 3. With silver ions Ag / AgCl reference electrodes. 4. 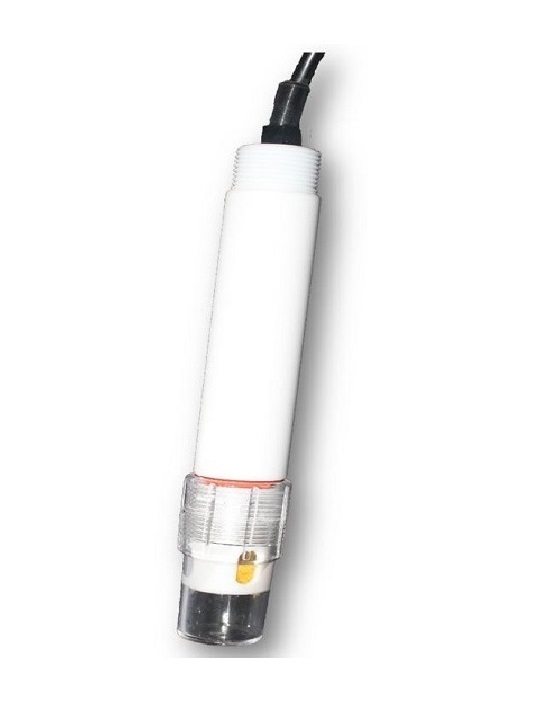 Pt1000 RTD, the temperature element used in the KE- pHS 1001 sensor is highly accurate and linear throughout the range. 1- Do not put Sensor directly into water, the sensor should be installed with Female Thread Socket for Inline Flow through Measurement and Threaded Sensor Housing for Offline Measurement. 2- Before installation, use Teflon Tape (at 3/4" Thread) to ensure no leakage occurs. 3- Connect the Sensor to Controller, let it stable for 3 Mins, then start calibration work. 4- Connect / Insert the Sensor vertically upright in the Solution whenever doing calibration. 5- Sensor to be installed Inline to piping where the pipe line doesn’t get dry whenever process is not operational. 1-	Sensor comes in a container filled with 3.3M KCL bubble solution in the packing and electrode soaks into the sponge to keep the glass bulb and liquid junction activating, however sensor can be washed with De-ionized water before use. 2-	Throw off air bubbles that are noticed on the glass bulb, otherwise it will cause measurement errors. 3-	Check if the tinned wires are dry and clean, otherwise use ethanol to clean and blow some air to wipe out dust particles. 4-	Stir the test solution with sensor to accelerate sensor response when calibrating than place the sensor in calibration solution. 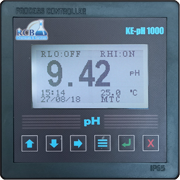 5-	Use 2 Points or 3 points calibrations with any NIST standard and TCT standard buffers for use with RCB pH controller KE-pH 1000. 6-	The sensor should be cleaned and calibrated periodically, if the liquid junction between sensor glass bulb and PTFE casing is contaminated use surfactant for cleaning. 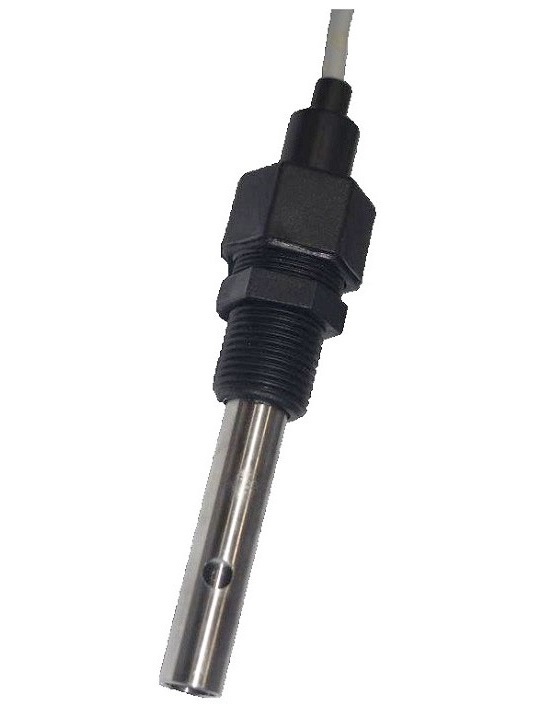 1- For 2 wire temperature sensor, short T/P4 and T/P3. Connect TEMP Wire 1 (Pink) with T/P 1 and TEMP Wire 2 (Black) with T/P 2. 2- Connect INPUT Wire 3 (Copper) with GLASS connection of Controller. 3- GND Wire 4 (Green) can be used if required. 4- Connect REF Wire 5 (Yellow) with REF connection of Controller. 1-	In case of any issue other than mentioned above, immediately inform RCB representative about the issue which will be resolved at the earliest. 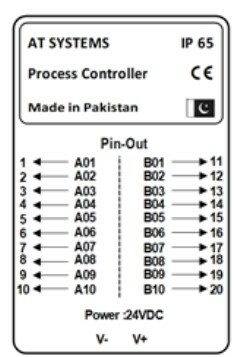 2-	Special fittings Inline or Offline for pH Sensor KE-pHS 1001 can be ordered to RCB separately.